Let’s ignore the Ubercharge bit for a moment. The weapon-dropping mechanic on its own is surprisingly ineffectual considering what everyone started worrying about when they first heard it was going to become a thing. The weapons aren’t that easy to actually pick up, the presence of nothing but sidegrades and the fact that you have to drop a weapon you actually chose to equip means that in the grand scheme of things it’s just a fun new ability that opens up rare moments of awesome, aids in allowing players to try out skins they otherwise don’t own, and causes relatively little harm to the Team Fortress core gameplay. But I may be one of the only players who has actually received an incredible buff from this new mechanic. This simple addition has granted my favorite loadout an amazing and reliable new way to overcome one of the only downsides it had since I already enjoy unparalleled mobility, high damage output, and health regeneration all at the same time. In unrelated news I practically stole one of the new strange normal grenade launchers. Time and again I find myself coming back to my single favorite loadout in Team Fortress 2: Grenade Launcher/Sticky Jumper/Persian Persuader. It’s got a unique synergy and a fast-paced playstyle; never stop jumping. Fly around the skybox looking for unsuspecting players, land behind them and blast them to pieces with your grenades, then fly away before any legitimate threat can retaliate. Prioritize sentries because you’ve got unlimited ability to choose the perfect spot to rain pipes from out of their range. And always pick up the ammo box/building scraps whenever you’ve killed anything to get huge chunks of your health back, giving you a level of survivability unheard of among the other classes who have a playstyle like this. The only downside is that you will almost inevitably run out of grenades, but when that happens you can quickly sticky jump back to spawn and tag the resupply locker in seconds. Or, starting now you can just replenish your ammo by dropping your sword every time you see another Demoman melee on the ground. 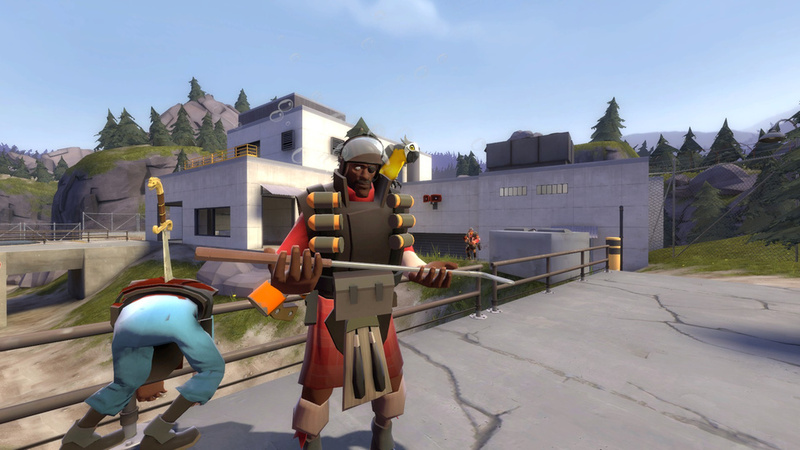 Thanks to the new mechanic and the preponderance of Demoknights in modern TF2 it’s quite frequent that I get a chance to grab a melee weapon off the ground, pick up a few nearby ammo sources to refill my Grenade Launcher, and then re-equip my Persian. As it’s probably the only playstyle in the game where ammo is the primary limiting factor, this newfound ability is a godsend and makes me feel awesome every time I pull it off. If you’ve never tried this loadout, I encourage you to give it a go. I consider it one of the most versatile loadouts in TF2, especially with this new buff. I’ve brought it up a couple or so times in the past, but if you’ve read all of those and still never decided to try this loadout, maybe this new buff is the thing to finally sway you. Not exactly hybrid knighting, but it’s an idea and a playstyle worth trying.